1. Design features, standards & materials. 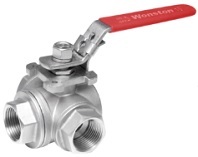 A stainless steel 3 way ball valve with common mounting pad, 1000 WOG. Design features: L port or T port 3 way type, reduced bore; threaded ends(NPT/BSP/BSPT), optional BW or SW; common ISO 5211 mounting pad, lever operated, 1000 WOG. Design standards: design code: ASME B16.34; wall thickness: ASME B16.34; pipe thread: ASME B1.20.1, BS21 DIN 2999/259, ISO 228/1 JIS B 0204, ISO 7/1; BW: ASME B16.25, SW: ASME B16.11; inspection & testing: MSS SP-110, EN 12266. 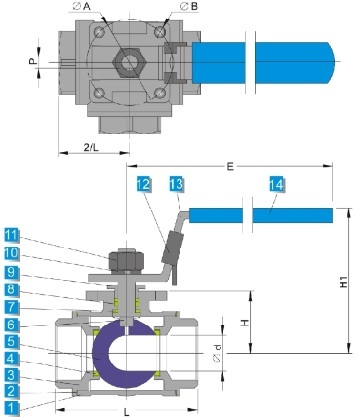 The G.A drawing illustration of stainless steel 3 way ball valve with common mounting pad, 1000 WOG. The material selection for stainless steel 3 way ball valve with common mounting pad, 1000 WOG. Other material are available upon request. Dimensional data sheet for 3 way ball valve with common ISO 5211 mounting pad, 1000wog. All dimensions are in mm unit.